We had a great time; it was certainly very challenging, but at the same time, enjoyable and great to do it with the family. That was a sense of achievement in itself. We had a fantastic group – quite diverse in age and fitness levels – we helped each other, and shared plenty of laughs and stories along the way. Physically we handled it well (glad we did lots of training). The track was wet and slippery in quite a few places but I think we got lucky with the weather. Naduri was one of our highlights; they looked after us well, and the song & dance at night with the village kids was a lot of fun. We were also able to get a bit more of an idea on how the villagers live, which makes us appreciate the life we have in Oz. The track covers some crazy terrain that has to be seen to be believed. To try to imagine what our soldiers went through was quite surreal. 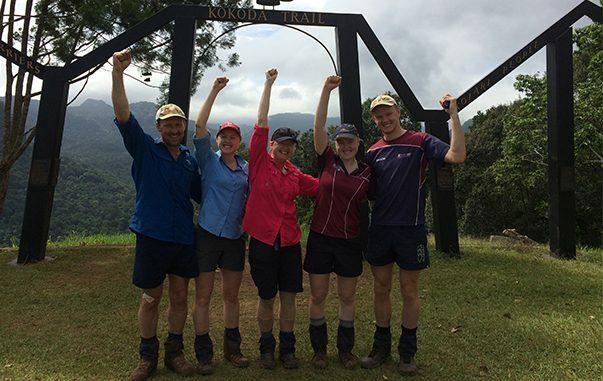 Would you like to experience Kokoda and its history with your family? Check out our 2017 and 2018 dates (tabs above), or call, email or drop in to speak with Clare who has done the trek and can get you and your family on a journey you will remember forever.